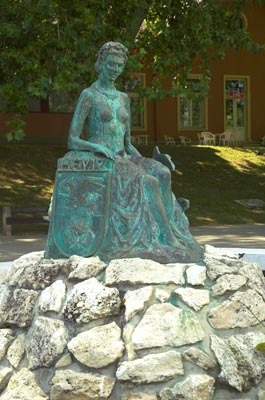 Heviz is well-known not only for its Spa-Lake and its curative mud, but also for having a statue or a monument at everywhere in the town. St Andrew on the cross. The creation of Jenő Molnar “The fairy of the Lake” has been located between the Spa-Lake and the main entrance of the hospital since 2000, while on the opposite side, at the entrance of the Spa-Lake there are two cherubs with wings that supposed to protect the Lake against demons. When walking down the Schulhof Vilmos esplanade towards the Winter Spa, you can see the bronze bust of count George Festetics. It has been prepared by Laszlo Marton Kossuth prize winning sculptor for the 200th anniversary of the opening of the Bath. In front of the Winter Spa, on the Lake side of Festetics Square you can see the monument of the Hungarian Nation. 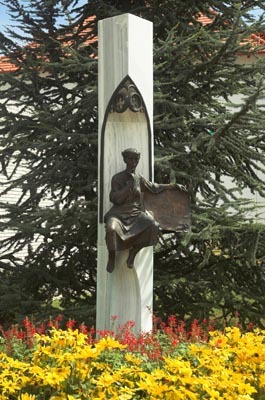 On June 8th, 1996 the monument sponsored by political organizations was created by the town of Hévíz, the Spa-Hospital, and the “Heviz-Spa 200th anniversary Foundation”. The monument of the Hungarian Nation was prepared by Jenő Molnár and Ferenc Gerics sculptors based on the plans of Dr. Lajos Kiss (former mayor of Heviz). Every year the monument is the scene for the remembrance of the tragedy caused by the Trianon Peace Treaty. If you have the time it is worth to discover the surrounding the Spa-Lake. 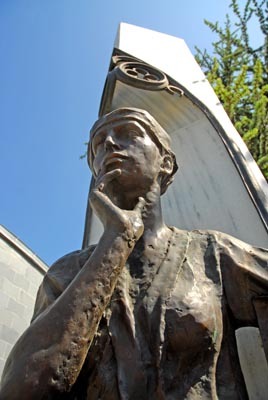 There are three figures in the Statue park in commemoration of three talents of Hungarian literature. All of them: Zsigmond Moricz, Mihaly Csokonai Vitez, and Daniel Berzsenyi had some attachment for Heviz. Their poems and writings recall the atmosphere of Heviz bath. 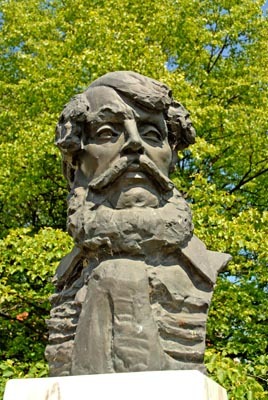 The bust of Berzsenyi by Tibor Riger and the bust of Csokonai created by Jozsef Ratonyi were inaugurated in 1976. The portrait of Zsigmond Moricz was prepared later by Laszlo Kutas. 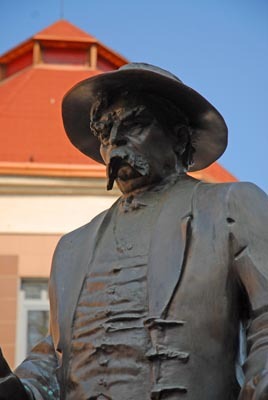 When walking from the Schulhof Esplanade you will reach the Square called dr. Moll Károly and see his full size bronze statue created by Laszlo Marton Kossuth prize winning sculptor. Dr Karoly Moll is the freeman of Heviz and the inventor weight-bath. The square and the statue has been inaugurated officially in May 2004. In front of the Holly Spirit Catholic Church next to Szechenyi Street there is a five meters tall column with the monument called “The Angel” on top of it created by Gregor Gal. To the west from the church you can see the relief of Istvan Szechenyi (the Street was named after him) created by Jenő Molnar. In the garden of the church there is a relief of St Stephan King, the founder of the Hungarian state. 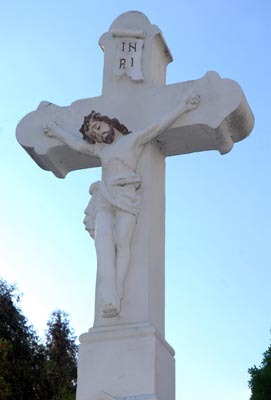 This is again the work of Jenő Molnar and it was placed in the park of the church in 2003. In front of the church, on the Városháza Square there is the fountain called Nympha .which was created by Laszlo Marton and has been there since 1998. From the direction of Zrinyi Street you can see the lustre glaze picture of St Stephan King on the wall of the city-hall. It was made by Laszlo Morvay, its size is 6×12 meters. In the vicinity of the city-hall, in Kossuth Lajos Street there is the column created by Ferenc Farkas in 1993 in commemoration of Heviz becoming a city. 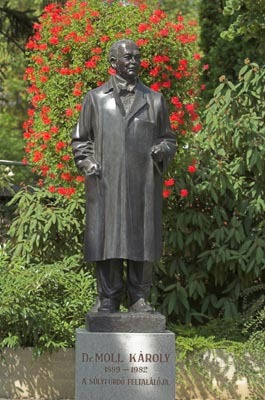 The statue of Imre Nagy prepared by Laszlo Marton stands in the park in front of the Post office. On the close-by square in front of Illyes Gyula Primary and Art School there is the portrait of Gyula Illyes carved by Istvan Marosits. The monument of Miklos Gyulai Gal General is also located close to the Primary School. It has been planned by Miklos Osvath artist and completed by Jeno Molnar sculptor. The other monument was established as the in commemoration of the revolution and fight for freedom of 1848-1849 and 1956. The October 23rd Park keeps the memory of the victims of the 1956 revolution and fight for freedom, Imre Arató’s work. In the graveyard of Heviz the monument created by Endre Tornai reminds us of the heroes of the World War II. In July 2000 the Holocaust Memorial located on the left side bank of the Heviz channel was inaugurated on the occasion of the 67th anniversary of destroying the church that used to be at this spot. The Pantheon of Heviz is on the wall of the WinterSpa, the first table has been placed on it in 1969. The Pantheon was established to commemoration of the talents of Heviz and the most famous patients visiting the city. There are thirteen memorial tablets: for Dr. Balazs Eggenhoffer, Dr. Kalman Zsirai, Dr. Vilmos, jr. Vencel Reischl, Pal Kitiabel, dr. Karoly Moll; five divers that died when doing research work: for Janos Sardy, György Ranki, Jozsef Babotsay, Lőrinc Szabo, Sandor Lovassy, and Otto Sterecker. The memorial tablets were created by Peter Szabolcs, Ferenc Farkas, Jozsef Simon, Jenő Molnár, and Miklos Borsos. Hunguest Hotel Hel…HévízVörösmarty Mihály utca 91. Apart Júlia VillaHévízZrínyi Miklós utca 38. KISS11 ApartmanHévízKisfaludy utca 11. Danubius Health Sp…HévízKossuth Lajos utca 13-15. Danubius Health Sp…HévízKossuth Lajos utca 9-11. Hunguest Hotel Pan…HévízPetőfi u. 9. Hotel Spa HévízHévízDr.Schulhof Vilmos sétány 1. Williams'HausHévízDr. Babócsay József utca 12. Korona Panzió Étte…HévízSzéchenyi István utca 43. Hotel AquamarinHévízHonvéd utca 14. Hévíz Castrum Gyóg…HévízTópart Palace Hotel HévízHévízRákóczi Ferenc utca 1-3. Erzsébet HotelHévízErzsébet királyné útja 13-15. Piroska ApartmanházHévízSzent András út 21. Familie VargaHévízSzent András utca 16. Kiss VendégházHévízKossuth Lajos utca 56. (hu) Hévíz Erika …HévízBartók Béla utca 2. Rideg Apartman HévízHévízKodály Zoltán utca 4. Marietta ApartmanHévízMóricz Zsigmond utca 117. Apartman GyapayHévízAttila utca 34.